On 12 June 2009, a-ha released their new studio album "Foot Of The Mountain" in Germany, Austria and Switzerland and on 15 June in Norway. The UK release followed on 27 July and the Japanese release on 4 November. The front cover the 8 page booklet is white with an abstract design of a mountain with triangles and bubbles! The a-ha logo and title is printed in black in the top left hand corner. Inside the booklet is some more abstract mountain artwork, a shot of the band (Magne, Morten, Paul) standing in their silver coloured suits in front of a skyline of building and telegraph poles plus song lyrics printed on black on white backgrounds on top of more abstract designs and leaves. The back insert features a shot of the band (Magne, Morten, Paul) in their suits plus some more of the abstract design is in the top right and bottom left corners. The track list is printed in white in the top left. The disc is green with a red, gold and brown abstract leaf pattern. A very large white a-ha logo is printed across the middle of the disc and cuts off at the edges. The title in small white letters is printed underneath. The rim of the disc is white with copyright, manufacturing and distribution text. Three record company logos are printed at the bottom of the disc: We love music and, Universal Music with Universal below. The back sleeves and discs differ slightly between the Norwegian and UK (and German?) releases, each of which have a different catalogue number. The back sleeve of the Norwegian edition has a long thin barcode under the track listing with a-ha Network AS and Universal Music AS Norway copyright details, this information is also printed on the outer rim of the disc. Neither the German nor Norwegian disc have a white rim around the disc and neither have the Universal Music logo. The Norwegian disc has the Polydor logo in place of the "We love music" one. The UK edition (pictured above) has Universal Music copyright information below the track listing and a barcode underneath. There are a few other minor differences between the UK and European releases. The ink on the disc of the UK release (above) is less smooth than the Norwegian edition (right) plus it includes the Universal Music Record logo on the disc and back cover and the copyright text differs. Some copies of the 10 track standard UK album were used for promo purposes and include some additional Record Company contact details. Copies exist with a rectangular white sticker displaying a large orange and dark grey "HESSO MEDIA" logo with the email address; "CHRIS or [email protected]", plus a smaller circular "PROMO ONLY NOT FOR SALE" sticker on the back of the case. 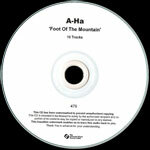 Another copy includes a large white rectangular sticker with the text "A-Ha 'Foot Of The Mountain' Out July 24th" plus Universal music contact information; "For further details contact Amy in Universal Music on (01) 4022600 / [email protected] For more visit…www.umusic.ie" and also the small circular "PROMO ONLY NOT FOR SALE" sticker. There is also a "nonstop promotions" stickered edition which again includes a white rectangular sticker with black text containing the release dates of the; "SINGLE: ‘FOOT OF THE MOUNTAIN’ – 20 JULY", "ITUNES FESTIVAL @ THE ROUND HOUSE – 24 JULY" and "ALBUM: ‘FOOT OF THE MOUNTAIN’ – 27 JULY". Some contact details; "Niki Sanderson / Stuart Kenning 020 8334 9994 / [email protected]" is also included along with the regular small circular "PROMO ONLY NOT FOR SALE" sticker over the barcode. Tracks: The Bandstand / Riding The Crest / What There Is / Foot Of The Mountain / Real Meaning / Shadowside / Nothing Is Keeping You Here / Mother Nature Goes To Heaven / Sunny Mystery / Start The Simulator. There is a silver sticker on the front of the EU made Norwegian edition with the text "BRAND NEW STUDIO ALBUM Inc. the Hit-Single "Foot Of The Mountain" plus the German, UK and Norwegian tour dates. There is an EU made German Limited PUR Edition of "Foot Of The Mountain". It comes in a slim cardboard sleeve with semi-circle thumb hole. The front and back cover art is similar to the regular release, but there is no album booklet. A red and white PUR sticker on the front has information in German, including the price (9,99 EUROs). A deluxe edition of the album was released in Germany on 4 December which includes a DVD in addition to the regular album The CD+DVD set comes in a fold-out digi-pak. The cover is similar to the regular album, but has a large "FSK ab 0 freigegeben" DVD rating in the bottom left hand corner. The CD sits in a clear tray on the left hand side of the digi-pak through which you can se some abstract art. In a similar way, the DVD sits on the right hand side. The DVD is of similar design to the CD, but is printed in blue tones rather than colours. The CD booklet sits in a pocket in the middle of the digi-pak. The booklet is the same as the one which comes with the regular album, but has four additional pages at the back with extra photos, information and track listing of the DVD. The DVD is 18:51 minutes long and includes the three recent videos of "Foot Of The Mountain", "Shadowside" and "Nothing Is Keeping You Here". It also includes two live tracks "Foot Of The Mountain (SWR3 Hautnah Live-Version)" and "Riding The Crest (SWR3 Hautnah Live-Version)". The catalogue numbers printed on the digi-pak, CD and DVD are 00602527268323, 00602527268330 and 00602527268347 respectively. There is a German acetate watermarked promo CD which comes in a neutral slim case and unique inlay sheet. The front of the insert is similar to the regular album. The reverse is similar to page 15 of the CD booklet with the tracks listed in the top right hand corner. The disc is silver with a-ha and the title printed in black at the top. The catalogue number, watermarked and Not For Sale - For Promotion Only is printed at the bottom. It comes with a German promo map, Universal logo map and 5 coloured pages with promo information and lyrics. The UK promo comes in a PVC sleeve with a paper insert. The front of the sleeve is similar to the regular album. The back sleeve is white with A-Ha, 'Foot Of The Mountain' and the track list printed in black letters. Copyright information and a unique number is printed at the bottom. The CD has a white label with black text. Another UK promo comes with the same paper insert, but the disc is silver with black titles. There is also a German acetate two track sample promo CD featuring "Rough Mix" versions of "Nothing Is Keeping You Here" (3:18) and "Foot Of The Mountain" (3:44), it comes in a slim-line jewel case with inlay sheet. The inlay is white with black title, tracks and Universal Music information. The title is listed as "A-HA - Rough Mixes -" and the two tracks are apparently demo, less electronic versions, unavailable elsewhere. These discs were produced only for record company people. The disc is plain with handwritten text. There is a white closing sticker on the side with the Universal logo and the text "Promo-CD Mit Wasserzeichen Nicht Kopieren". Another promo only item is a Soundmasters reference CD. It comes with a folded paper insert with album information on the front in black with "The Soundmaster" logo in green at the top. The album track listing is printed in black on the reverse. The disc is white the "The Soundmasters" logo in blue at the top plus "Reference CD" and date "21.05.09" on the left hand right hand sides respectively. "A-ha CD Album", catalogue number and "Universal Music TV" is printed in black at the bottom of the disc. The The Argentinian album is similar to the European release with some minor differences, the position of the barcode is directly under the track listing on the back sleeve and there is some different record company logos to include the "LAB 344", "rp music" and "Random Records". The manufacturing and copyright information is mainly printed in Spanish; "(P) 2009 a-ha network as, under exclusive license to LAB 344 / Radoszynski Producciones S.A. bajo fabricacion y distribucion exclusive de Random Records S.R.L. Reservados todos los derechos de los autores, interpretes y productores fonograficos sobre las obra registradas en este compact disc. Prohibida su reproduccion, su alquiler y ejecucion publica o radiodifusion. SADAIC-BIEM-AADI-CAPIF. Disco es cultura, Industria Argentina". There are also several Website addresses displayed on the back sleeve; "live4musikμsikwilllive4ever www.lab344.com.br", "www.rpmusic.com.ar", "info at rpmusic.com.ar", "www.randomrecords.com.ar" and "info at randomrecords.com.ar". The disc itself also features the Argentinian record logos and Spanish copyright information. The catalogue number printed on the spine is "RP292" but the number under the barcode is "7798014092922". On the front of the case, in the top right hand corner, is a blue rectangular sticker which reads "UNA HISTOIA DE 25 ANOS DE CARRERA REVELADA EN DIEZ CANCIONES INEDITAS! INCLUYE LOS HITS "FOOT OF THE MOUNTAIN" "SHADOWSIDE". The booklet is the same as the European release. The first Brazilian CD pressing of "FOOT OF THE MOUNTAIN" is similar to the European release and comes with the same colour booklet; it was manufactured by "Cooperdisc", custom of Globaldisc under exclusive license to LAB 344. The Manufacturing and Record Company Information is displayed on the back sleeve and partly on the disc which reads; "(P) 2009 a-ha network as, under exclusive license to LAB 344. Produzido por Cooperdisc CNPJ: 05.505.400/0001-72, sob encomenda de Globaldisc Ind. E Com. de CDs e DVDs Ltda. CNPJ: 08.706.856/0001-99. Todos os direitos reservados. Proibida a reproducao, execucao publica e radiodifusao. LAB 09027". There is also a LAB 344 Brazilian website address; "www.lab344.com.br" with the slogan "live4musikμsikwilllive4ever" displayed on the back sleeve. The LAB 344, "CD promo" and "COMPACT DISC DIGITAL AUDIO" are additionally included on the sleeve and disc. The white barcode also on the back sleeve is smaller compared to the European release and comes with a different number 7898937714809. There are at least four issues of this first pressing, all are the same, but come with a different batch issue coding on the spine and etched in white around the centre ring of the disc, these being; AA3000, AB2000, AC1000 and AD1000. Some of the earlier copies came with an additional blue rectangular sticker on the front of the CD case displaying; "UMA HISTORIA DE 25 ANOS DE CARREIRA REVELADA EM DEZ BELAS CANCOES INEDITAS! INCLUINDO OS SUCESSOS: “FOOT OF THE MOUNTAIN". The Catalogue number is LAB 09027. There is a 5 track Brazilian promo sampler album featuring "Foot Of The Mountain", "What There Is", "Real Meaning", "Mother Nature Goes To Heaven" and "Nothing Is Keeping You Here". The CD comes with a paper insert. The cover design is similar to the regular album, but has "SAMPLER ALBUM" printed in black under the title. The disc is white with black titles, track list and Universal logo. The second Brazilian pressing was manufactured instead by "NovaDisc" under exclusive license to LAB 344 and comes with the same regular front and back cover artworks as the first pressing, the same Brazilian blue rectangular sticker which usually appears on the front of the CD case (on some copies) has now been printed directly onto the actual front cover of the regular colour booklet. The Manufacturing and Record Company information on the back sleeve has also been changed and reads; "(P) 2009 a-ha network as, under exclusive license to LAB 344. Produzido no Polo Industrial de Manaus por NovoDisc Midia Digital da Amazonia LTDA. Av Abiurana, 566, Distrito Industrial, Manaus, AM. CNPJ: 02.104.848/0001-96 sob encomenda de LAB 344 Producoes Artisticas LTDA. CNPJ: 07.179.420/0001-26., LAB 10178-2". The same LAB 344 Brazilian website address; "www.lab344.com.br" with the slogan "live4musikμsikwilllive4ever" is again displayed on the back sleeve. The LAB 344 and "COMPACT DISC DIGITAL AUDIO" logos are both included on both the back sleeve and disc, but the "CD promo" logo has been omitted and replaced instead with the Flying "PRODUZIDO NO POLO INDUSTRIAL DE MANAUS" Amazon bird logo on the back sleeve only. The number shown on the white barcode has again been renumbered to 0040232732546 and the batch issue coding AA002000 is additionally printed on the spine and etched in white around the centre ring of the disc. The Catalogue number on this second pressing has also been changed to LAB 10178-2. There is another Brazilian CD release which was manufactured by "Sonopress" under license to "WE LOVE MUSIC" and again comes with the same front and back cover artworks as the previous editions. On the front cover there is a white promotional sticker with black printed text displaying "arvato digital services AMOSTRA GRATIS TRIBUTADA PROMOCIONAL PRUDUTO INVENDAVEL" which translates to; "arvato digital services FREE SAMPLE Taxed PROMOTIONAL PRODUCT unsaleable". On the back sleeve, the Manufacturing and Record Company information is different compared to the earlier pressings, it reads; "(P) 2009 a-ha network as, under exclusive license to WE LOVE MUSIC © 2009 Universal Music A/S. Produziido no Polo Industrial de Manaus e distribuido por Sonopress Rimo Industria e Comercio Fonografica S.A. – Industria Brasileira – Rua Ica, n° 100-A – Distrito Industrial – Manaus – AM. CNPJ: 67.562.884/0004-91, sob licenca da Universal Mlicenca da Universal Music International Ltda. CNPJ: 08.975.642/0001-18. Denuncie a pirataria: [email protected]". The Anti-pirate Website address is also included. Also displayed on the back sleeve is the Flying "PRODUZIDO NO POLO INDUSTRIAL DE MANAUS" Amazon bird, "COMPACT DISC DIGITAL AUDIO", "UNIVERSAL MUSIC GROUP" and "WE LOVE MUSIC" logos. There is a white barcode included which is slightly larger compared to the earlier pressings, it contains the same number as the Catalogue number 60252708998 and additionally shows the batch issue coding AA0002500. There is a Canadian CD release of "Foot of the Mountain" which was Manufactured and Distributed by "Universal Music Canada Inc", it comes with the same front and back cover artworks as the European release including the colour booklet. The Manufacturing, Distributing and Copyright information is displayed on the black sleeve and around the outer edge of the disc; "(P) 2009 a-ha network as under exclusive license to WE LOVE MUSIC. © 2009 Universal Music Domestic Pop, a division of Universal Music GmbH. All rights reserved. Manufactured & Distributed by Universal Music Canada Inc., 2450 Victoria Park Ave., Suite #1, Toronto, Ontario M2J 5H3. Unauthorised reproduction, copying and rental of this recording is prohibited by law". Additionally shown on the back sleeve is the "GETMUSIC.CA", "UNIVERSAL MUSIC GROUP" and "WE LOVE MUSIC" logos. There is a small white barcode also included. Around the centre ring of the disc it has engraved "MADE IN CANADA". The Catalogue number is 2708998. There is a Chilean bonus edition of "Foot Of The Mountain" which comes with three bonus tracks "Foot of the Mountain (Remix) - Erik Ljunggren Remix (4:49)", "Shadowside (Alternative Version) (4:03)" and "Nothing Is Keeping You Here (Steve Osborne Remix) (3:21)". The booklet is similar to the European release, but additionally includes a black printed rectangular box located in the bottom left hand corner of the front cover with some white text printed mainly in Spanish; "UNA HISTORIA DE 25 ANOS DE CARRERA CONTADA EN BELLAS CANCIONES INEDITAS Incluye el exito "FOOT OF THE MOUNTAIN" + 3 REMIX BONUS TRACKS", when translated it reads; "A HISTORY OF 25 YEARS OF CAREER COUNTED IN FINE UNCORTAIN SONGS Includes the success "FOOT OF THE MOUNTAIN" + 3 REMIX BONUS TRACKS". On the inside of the booklet, the track listing has been amended on the inside back page to include the three bonus tracks. The front of the CD case also includes a silver "ifpi" hologram sticker. On the back sleeve, the track listing is printed in the usual white down the left hand side with the bonus tracks now included at the end, each track also additionally comes with a track number from 1 - 13 at the beginning, plus under the track listing is the "LAB 344", "DISCOS CNR CHILE ®" and "COMPACT disc DIGITAL AUDIO" logos. The Catalogue number 14576-2 is also present but differs compared to the European release. At the top right hand corner of the back sleeve is a white barcode which again comes with a different number "7 804606 566044" and is displayed landscaped rather than orientated. There is also some Production and Copyright information included at the bottom right hand corner which is printed in both English and Spanish; "(P) 2009 A-Ha Network AS, under exclusive license to Lab 344 Producoes. : bajo distribucion exclusive a Discos CNR de Chile Ltda. (P) & (C) 2009 Discos CNR de Chile Ltda". A red paint splat anti-piracy logo with the text; "NO MATES LA MUSICA COMPRA SIEMPRE EI ORIGINAL" is additionally displayed. 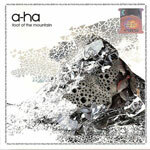 On the spine, the regular artwork layout is shown with the title "foot of the mountain" in the centre with a-ha on the right hand side, and the revised Catalogue number 14576-2 and square "DISCOS CNR CHILE ®" logo on the left. 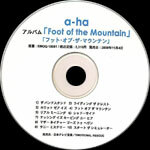 The disc itself comes with the regular colour artworks displaying the large a-ha logo across the centre and title "foot of the mountain" underneath in white. The "DISCOS CNR CHILE ®" logo is displayed at the top with the "LAB 344" and "COMPACT disc DIGITAL AUDIO" logos plus Catalogue number 14576-2 at the bottom. Around the outer rim of the disc printed in black is the same Production and Copyright information which appears on the back sleeve, but some additional Spanish Copyright text has been included; "RESERVADOS TODOS LOS DERECHOS DEL PRODUCTOR FONOGRAFICO Y DE LOS TITULARES DE LAS OBRAS GRABADAS. PROHIBIDA LA REPRODUCCION, ALQUILER, PRESTAMO, EJECUCION PUBLICA, RADIODIFUSION Y DEMAS UTILIZACIONES DE ESTOS FONOGRAMAS. LEY Nº 17.336". The Japanese edition of "Foot Of The Mountain", released on Emotional Rescue, comes with an obi-strip. The cover artwork is similar to the European release, but on the reverse, there is Japanese manufacturing information and the text "NIPPON TELEVISION MUSIC CORP" but no bar code. There is also a white sticker with black Japanese text on the front of the jewelcase. It comes with a folded paper insert with the lyrics, the track listing and other information in Japanese. The obi-strip is white with blue and black Japanese text. There are also blue and pink blocks of colour with white text on the obi-strip. The release date printed on the obi is 09.11.04. The disc is similar to the European disc, but has Japanese manufacturing information printed on it. In addition to the regular track list, it includes the bonus track "Foot Of The Mountain (Erik Ljunggren Remix)" (4.49) which is just listed as "Foot Of The Mountain (Remix)". There was a special deluxe edition released on 21 July 2010 (solitarymanrecords.com) which comes with a second bonus disc in a separate jewelcase. It has a light blue card insert with white border, a-ha, the title and tracks are printed on the left hand side in black. The reverse of the insert is white a grey background box along the top with questions from Japanese fans, written in Japanese below. 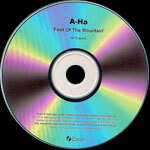 The disc is blue with a large white a-ha logo across the centre and title in white underneath. It features the two download only tracks "Foot of the Mountain (Erik Ljunggren Remix)" (4.51) and "Foot of the Mountain (Boheme 7" Remix)" (6.57). Both CDs come wrapped in a larger obi-strip which is dark blue with a white spine. The obi is covered in Japanese text. There is also a 10 track Japanese promo of "Foot Of The Mountain". It comes in a slimline jewel case with insert. The front of the insert is light blue with a bright blue strip across the centre. A small picture of the regular album cover is printed at the top of the sleeve with blue, white and black text printed below. The reverse of the insert is also light blue with text in black, two strips of the darker blue separating the track information plus a small colour picture of the band in the silver suits on a blue background is placed in the bottom right hand corner. The disc is white with title in blue and track information in black. Apart from the album title, the rest of the text is in Japanese except for the words "Emotional Rescue" at the bottom. There is also a release date of 04/11/2009 printed on the disc and sleeve. The Album comes in a jewel case with a folded insert similar to the front and back pages of the regular European release. There are no lyrics included. There is a silver holographic sticker in the top right hand corner of the front insert with the text "TULEN KPDN & HEP ORIGINAL" and "K7025702" in black text. The text "Malaysia Edition" is printed in black all the way round the edge of the front insert. The album has been manufactured and printed in Malaysia. A flag and "Malaysia Edition" logo is printed on the inside back cover. The Polish album of "Foot Of The Mountain" is of similar design to the Malaysian edition but has "ZAGRANICZNA PLYTA - POLSKA CENA" printed around the edge of the front sleeve. It also comes with a folded insert without lyrics. The CD has a blue, white and red circular "Olska Cena" sticker plus a red and white "Muzodajnia.pl" rectangular sticker on the front case. The design of the back sleeve is similar to the Norwegian edition but with the Polish catalogue number. On the back of the CD case there is a silver hologram sticker plus small white rectangular sticker with contact names and addresses at Universal music in Poland. On the inside of the back insert is the text "ZAGRANICZNA PLYTA - POLSKA CENA" which can be seen through the spine of the CD. The CD comes with a red and white "muzodajnia.pl" flyer. The Romanian CD was made in the EU. It is of a similar design to the Polish and Malaysian pressings with the text "SPECIAL PENTRU ROMANIA" printed around the edge of the front cover. It comes with a folded insert without lyrics. It comes with "ROMANIA PRODUS ORIGINAL" hologram plus pink and black "PROPUNERE GUERRILLA' 'UDIO GUERRILLA' 'ELIDERADIO / Universal Music Romania" stickers on the front. The image of the National Romanian flag and text "Special pentru Romania" is printed on the inside of the back cover and can be seen through the front spine of the CD. The Catalogue number has also been changed to 06025 2713644 8 (70). The Russian release is similar to the European release, but comes with a picture obi-strip. The obi-strip is white with the a-ha logo and picture at the top with text underneath. There is also a black and white Universal sticker on the front of the booklet. The black sleeve is also similar, but with more text and different position of the bar code. The disc is similar to the German edition but with some additional Russian text around the edge. There is also a deluxe Russian edition which is similar to the German deluxe release but it comes in a double jewelcase with a silver hologram sticker on the case and obi-strip. The front of the obi-strip is black with a shot of the band at the top and titles in white below. The back of the strip is also black with white text and advertises a couple of U2 albums. The spine of the obi is similar to the spine of the album, white with blue patterns and text. It comes with a folded insert without the song lyrics. The track information and credits are printed on the left hand side of the inside of the insert. The DVD design and DVD tracks are the similar to the German release, although the surface of the Russian discs feel smoother and have a white rim around the edge (the rim of the German edition is silver). There is a CD and DVD deluxe edition of the album from the Ukraine which is similar to the German deluxe edition. It comes in re-sealable cellophane with a round pink CD + DVD limited edition sticker plus a white rectangular Rok Music / Art Menu contact sticker. The from cover of the release has a silver hologram Universal sticker plus a black and white Universal sticker. There is another silver hologram sticker on the back cover. It comes with a folded insert without lyrics or DVD track listing. The back cover has most of the record company information in Ukrainian. There is also some Ukrainian text around the outer edge of the discs. There is a Ukranian promo CD which comes in a PVC wallet with a stiff shiny paper insert. The front features the usual artwork but with the title printed in Ukrainian underneath the English title. The back of the insert is white with the title (again in English and Ukrainian) and track listing in black on the left hand side. There is some promotional text in Ukrainian and English at the bottom of the sleeve plus the Universal and Ukrainian Records logos. The catalogue number is printed in the top right of the back of the insert. The cover artwork has been printed on the disc along with the title in English and Ukrainian plus the track listing, logos and Ukrainian Records contact information and catalogue number. Promotional text is printed around the edge of the disc. 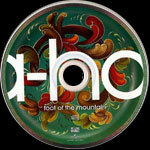 Japan promo Foot Of The Mountain EMOQ-10001?